Join the ANSWER Coalition in the streets for mass actions over the next three days. Saturday, Jan. 14 at 11 a.m.
7th & O Sts. NW, Washington, D.C. Despite having only 5% of the world's population, the United States contains 25% of the worlds incarcerated persons, with 2 million people imprisoned. This is over 1 million more than the country with the next largest prison population. Driven by the ruinous so-called “War on Drugs,” the mass incarceration epidemic is disproportionately aimed at poor and working-class communities, particularly those that are mostly Black. Nearly one out of two people in the United States lives either in poverty or close to poverty. Mass unemployment among young people is a dominating reality. Just over 35% of those in prison are Black, despite Black people representing roughly 13% of the population. 21.2% of those incarcerated in the United States are there for non-violent drug offenses. The proliferation of “supermax” prisons around the country has rapidly increased the number of prisoners subjected to prolonged isolation. Long-term isolation is widely considered akin to torture. End the Drug War Now! Release All Non-Violent Drug Offenders! 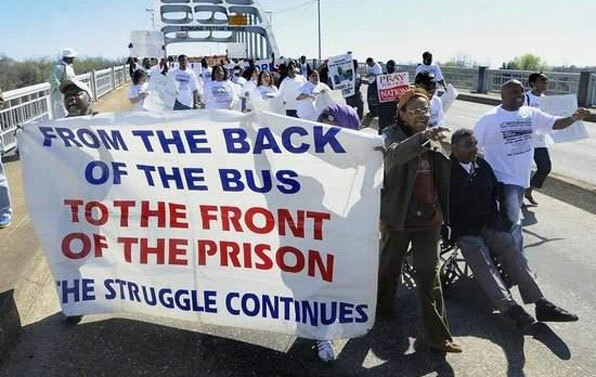 End Exploitation of Prisoners Families! End Inhumane Living Conditions in Prisons! Jobs not Jails! Bring the message of jobs, housing and health care, not war! The ANSWER Coalition is proud to join in honoring the legacy of Dr. Martin Luther King Jr. by participating in MLK Day parades across the country on Monday, Jan. 16. We will be there raising the banner of social justice, jobs, health care, and housing, not endless war for empire. Join us to show your commitment to ending war and racism in the spirit of unity and solidarity! 10am: Meet at march site, corner of Western Ave. & MLK Blvd. March to Yerba Buena Garden (Mission St. between 3rd St. and 4th St.) for a rally and performances. We can't do this work without you. The ANSWER Coalition is organizing everyday all over the United States, connecting the dots between war, racism and economic injustice. Please make an urgently needed donation to support the work of the ANSWER Coalition.